Dana is looking for the WHITE or PINK version of this bear. We received the green bear yesterday. It is wonderful! My 8 year old has a white one by Animal Alley, and I’ve searched for years for another one for my younger daughter. This green one looks just like the white one – he is just GREEN. So, we’ve told my younger daughter that she has White Bear’s brother, Green Bear! PERFECT! 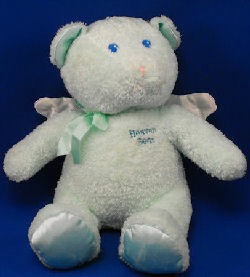 So I’m still looking for an Animal Alley 2000 13 inch terry angel bear with white satin wings, bow, and footies. It says “Faith, Hope and Love” over the heart. There was also a pink one made at some point, but I don’t know what that one says. They really are lovely bears! White Bear is 8 years old now, so he is very loved! If you find one in white or pink, please let me know! I know my older daughter would love to have a newer one. Here is one on ecrater. let us know if either or both of these fulfills the search. Best wishes!